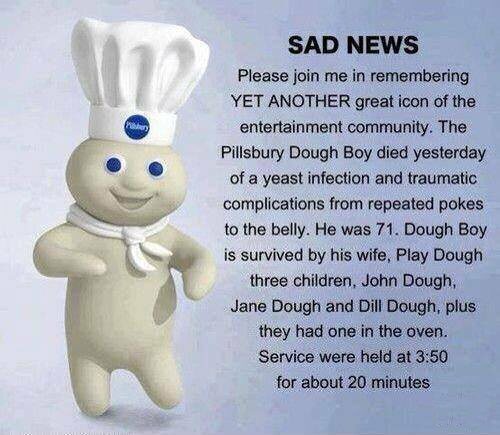 Veteran Pillsbury spokesman Pop-N-Fresh died yesterday of a severe yeast infection. He was 71. Fresh was buried in one of the largest funeral ceremonies in recent years. Dozens of celebrities turned out, including Mrs. Butterworth, the California Raisins, Hungry Jack, Betty Crocker, and the Hostess Twinkies. He was not considered to be a very smart cookie, wasting much of his dough on half-baked schemes. Still, even as a crusty old man, he was a roll model for millions. Fresh is survived by his second wife. They have two children and one in the oven. The funeral was held at 2:25 for 20 minutes. Please join me in remembering a great icon. Veteran Pillsbury spokesperson, The Pillsbury Doughboy, died yesterday of a severe yeast infection and complications from repeated pokes to the belly. He was 71. Doughboy rose quickly in show business but his later life was filled with many turnovers. He was not considered a very smart cookie, wasting much of his dough on half-baked schemes. Despite being a little flaky at times, he still, as a crusty old man, was considered a roll model for millions. Toward the end it was thought he’d raise once again, but he was no tart. Doughboy is survived by his second wife, Play Dough. They have two children, and one in the oven. The funeral was held at 350 for about 20 minutes.